Look in the April Night Sky! Is It a Herdsman, Bear Driver … Or Ice Cream Cone? 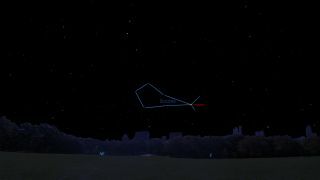 The Bootes constellation over New York on April 5, 2019, at 9 p.m. local time. I'm sure that many are familiar with the proverb "March comes in like a lion and goes out like a lamb." Certainly this is a commentary on the weather, although we could also say there is some astronomical connotation to this adage as well. As darkness falls on the first day of March, low in the eastern sky we can see Leo, the Lion crouching in an upward position from above the eastern horizon. But on the final day of March, as evening twilight fades, we find, looking low toward the east-northeast, that Leo has been replaced by the constellation of Boötes, the Herdsman. Now what is the definition of a "herdsman?" In doing a little research I found that a person with such a title is the owner or keeper of a herd of domestic animals, a sort of jack-of-all trades: a stockman, cattleman, cowboy ... or even a shepherd or sheep rancher. And since it is only during the springtime that shepherds and sheep ranchers will spend nights in their fields when lambs are being born, we might say that for stargazing, March indeed comes in with a lion and goes out with a lamb. For American stargazers, Boötes holds another occupation: Bear Driver, an allusion to the way he follows Ursa Major (the Great Bear) around the sky. To those living in the United Kingdom he is the Ploughman, since he follows their version of a Plough (the Big Dipper) in the sky. A few authors even refer to him as a hunter or warrior, but I believe those titles should be reserved solely for Orion. Boötes is most noteworthy for its brightest star, Arcturus, one of the most brilliant stars in our night sky. The name comes from the ancient Greek, Arktouros, meaning "Guardian of the Bear." Of all the stars in our sky there are few so bright and colorful. Arcturus is the fourth brightest star in the sky and the brightest that shines north of the celestial equator. It glows with a distinct golden-orange color. Arcturus is approximately 25 times larger than our sun and about 170 times more luminous. There is a well-known stargazer's saying: "Follow the arc to Arcturus." The "arc" refers to the broad curve that is made by following an imaginary line along the bend of the Big Dipper's handle, until you arrive at Arcturus. That certainly is a handy way to find it, although in the same terms that I recently noted for the night sky's brightest luminary, Sirius, you hardly need to use the Dipper's handle to "find" Arcturus! Just step outside after it gets dark anytime this week and look east-northeast and Arcturus will immediately grab your attention. It's that bright. The other stars of Boötes form what looks to be a long, kite-shaped figure. That's somewhat appropriate since March and April days can sometimes be rather windy, providing great weather for flying a kite. Extending from Arcturus we can even see a short appendage of stars that might serve as the kite's tail. April also marks the return, in many neighborhoods, of the ice cream man who would come down the street in the late afternoon, ring his bell and attract kids with a variety of frozen specialties, most notably ice cream cones. When I'm giving a sky show at New York's Hayden Planetarium, I'll tell my audience that if they don't particularly care for envisioning Boötes as a longish kite, they could turn him into an ice cream cone as well. Of course, what kid has ever had a cone and not at one time or another bitten off the bottom tip? This gives us a clue as to what flavor is contained in our cone in the sky. The bottom of the cone is marked by Arcturus, so think of that as a "bloplet" of orange sherbet! Finally, when I was in grammar school and just started getting interested in astronomy, I found Boötes in one of my first constellation books, Robert H. Baker's "When the Stars Come Out" (Viking Press, 1934). The "long kite" figure is shown, but because of its sideways orientation in the early-evening spring sky it looked to me much more like a boot or shoe. So I automatically assumed that the name Boötes meant "the Boot." Boötes is thus unusual in that it's a star pattern whose very name and appearance suggests something it isn't. Most of you probably would pronounce the name as Boo-teez, but that is incorrect. Have you noticed the two dots above the second ö? That's called a "diaeresis," a mark placed over a vowel to indicate that it is sounded in a separate syllable. So the correct pronunciation is Bo-oh-teez. Arcturus made headlines in 1933, when it was used to turn on the lights at the opening of the Chicago World's Fair on the night of May 27. Four different observatories (Yerkes, Illinois, Harvard and Allegheny) were employed to trap the star's rays by photoelectric cells, then amplify them and relay them to the master switch at the fair. At 10:14:30 p.m. Central Time, the switch was closed and the myriad lights at the "Century of Progress Exposition" were illuminated. So popular and successful was this venture that the process was repeated by the Westinghouse Electric and Manufacturing Co. every night of the fair. Why Arcturus (which was known at the fair by the nickname "Arky")? The previous world's fair in Chicago had been in 1893, and in 1933, the best estimates for the distance of Arcturus was 40 light-years. So it was widely promoted that the light rays from this star that started on their way to Earth at the time of the 1893 fair were now reaching Earth in time to help illuminate the 1933 fair. Today we know that Arcturus is actually 37 light-years away, not 40. But what's 3 light-years (or 17.63 trillion miles) among friends?